I'm not sure if you would call it a blessing, but ever since I was a young girl I've had big thick eyebrows- like Brooke Shields (mom used to say). Those of you from my freshman year of college know what I am talking about. Since then, I have learned to wax and tame these bad boys the only way I know how - wax and pluck. Back in the day we would use GiGi Wax because it would grab even the most stubborn, tough hairs. The downside? It was painful and left you red for hours! That is when I began my search for a better waxing alternative. I think I've just about tried everything - Nad's, Nair, Sally Hanson and nothing seemed to work except GiGi. So when I first came across Bliss Poetic Wax I was skeptical. I really didn't want to spend $45 for something that didn't work. But after reading many magazine and online reviews about how great it was, I had to try it. Bliss Poetic Wax Kit is amazing! It's way more gentle than waxing with the traditional stuff (GiGi) and is super simple to use. It's so easy to apply that my waxing time has been cut down considerably. Not only does the melting process begin at a low temperature (so it's fast), but the blue wax helps me see where it goes (less mistakes). My other favorite part? No waxing strips! You just peel off the wax baby. It's as easy as that. Bliss also got it right when they added pre-waxing lotion to the kit. They say the lotion keeps wax from sticking to the skin, and shrink wraps tough hair to pull it straight out from the root. Well it's no wonder my skin is less red afterward! I also believe the cleanser and the lotion help soothe my skin afterward, so there aren't any breakouts. YAY! 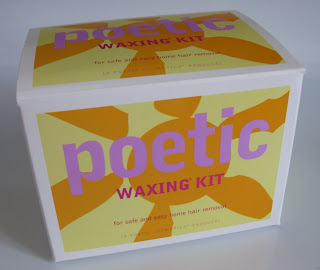 Although the Poetic Waxing Kit is my all time fave, I am still looking for a more permanent solution. It would be nice to have no upkeep. So a friend of mine recently suggested I get laser hair removal treatments. She absolutely loved the result from her treatments and is now enjoying little to no maintenance! I know laser is not meant for all skin types, but it's something I will research and discuss with a doctor to see if it's right for my skin. Of course, you know me-I'll let ya know how it goes.